Lawyers have many words for the common law amount of money an employer must pay an employee when they are dismissed without cause or for unjust cause, also known as unjust or wrongful dismissal. The facts of each case below have been truncated and edited. For a full or thorough analysis of the particular case, particularly if it is to be used in a real dismissal case, please consult the relevant law report, citations provided at the bottom of this article. 52 year old employee earning $24,400 at time of dismissal in a general labour position, 19 years service, 15 months severance. In this case, the employer offered 18 months severance and referred to his alleged obesity: "... the plaintiff's ability to properly perform his duties was significantly impaired by the plaintiff's physical condition." "The onus is on the employer, Wabush, to show cause for dismissal and in this action I find Wabush has not discharged this onus. 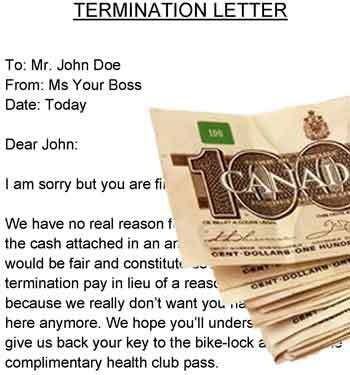 Therefore the plaintiff is entitled to reasonable notice of termination. "The law is quite clear on this point. In the absence of a written contract an employee whose employment is terminated without cause is entitled to reasonable notice. The reasonableness of the notice will be determined by several factors.... (a) age, (b) length of service of the employee, (c) responsibilities of the employee, (d) experience, (e) status, (f) training, (g) qualifications of the employee; and (h) other factors. "I would add to this list the following: chances of alternate employment; and health of the employee (assuming that is not a factor leading to the dismissal). "The 18 weeks' severance pay given the plaintiff is inadequate. Considering the evidence in its totality I conclude and so find that a reasonable termination allowance for the plaintiff, in this action, from Wabush in lieu of adequate termination notice is 15 months' full pay." 53-year old employee earning $54,000 time of dismissal in a skilled labour position, 10 years service, 10 months severance. The plaintiff was finance manager and controller, eventually becoming a vice-president. Brown accepted a lateral transfer but not a pay drop. When he found out about the pay drop, the horns were locked, with the British Columbia court finding that the defendant had repudiated the employment contract by attempting to impose a salary drop. "At his age he is undoubtedly having difficulty finding suitable employment and he may have difficulty re-establishing his career. Taking into consideration these factors and the various authorities cited by counsel, I find the period of reasonable notice of termination of employment to which the plaintiff was entitled was 12 months." In this, the grand-daddy of Canadian unjust dismissal cases, Jack Wallace was lured over to the Defendant from a competitor company. Then, one day, he was suddenly dismissed without any explanation after having been the Defendant's "top salesperson for each of the years he spent in its employ". A week after dismissal, the employer issued a lame justification: Wallace's alleged "inability to perform his duties satisfactorily". The trial court, the Manitoba Court of Queen's Bench said it was a wrongful dismissal and gave Jack Wallace 24 months severance. On Appeal, the appellate court reduced the termination pay to 15-months. "In the absence of just cause, an employer remains free to dismiss an employee at any time provided that reasonable notice of the termination is given. In providing the employee with reasonable notice, the employer has two options: either to require the employee to continue working for the duration of that period or to give the employee pay in lieu of notice. during the period of notice to which he or she was entitled. "There can be no catalogue laid down as to what is reasonable notice in particular classes of cases. The reasonableness of the notice must be decided with reference to each particular case, having regard to the character of the employment, the length of service of the servant, the age of the servant and the availability of similar employment, having regard to the experience, training and qualifications of the servant. "To ensure that employees receive adequate protection, employers ought to be held to an obligation of good faith and fair dealing in the manner of dismissal, the breach of which will be compensated for by adding to the length of the notice period. "In the course of dismissal employers ought to be candid, reasonable, honest and forthright with their employees and should refrain from engaging in conduct that is unfair or is in bad faith by being, for example, untruthful, misleading or unduly insensitive." 62-year old employee, 26 years service as a Rabbi: severance pay: 27 months. The employee had risen from a post of teacher to full-fledged Rabbi in 1989 while in the employ of the Defendant. In 1994, he was told his contract would not be renewed in 1995. At trial, he argued that although there were intermittent contracts, he was an indefinite term employee and therefore eligible for severance pay. "With respect to all of the agreements that the plaintiff signed, I find that it was never his intention to be employed for a limited term. I find that the amount of remuneration was to be renegotiated from time to time but that he was to be employed in the long term. "(T)here were many agreements which, in my view, were not considered as serious documents to be relied upon by the parties. The plaintiff worked sometimes without a document. At times he worked with a document that was prepared but it was not signed by the parties. "The plaintiff was never told and was not aware of a fixed term. This fixed term was never explained to him. "(A) reasonable notice period at common law is 30 months to include the nine months working notice." 29 year old store manager, 5 years service when terminated. The Plaintiff was terminated from his store manager position with Edmonton Cellular based on stated sexual harassment which, at trial, did not stick. The touching was "inappropriate" but "not sufficiently serious to warrant immediate dismissal". Thus, the employer faced an unjust dismissal claim. The trial judge set 5 months as the severance pay and then doubled it to 10 based on punitive damages, to punish the employer's error in regards to the sexual harassment allegation. "None of the conduct pointed to by the respondent can be said to amount to the kind of bad faith conduct in the manner of dismissal that would warrant such an award. The Wallace damages are about how to fire an employee, and extending the notice period for bad faith conduct on the part of the employer in doing so. "The conduct of the appellant in the manner of the dismissal cannot be characterized as bad faith, and accordingly must be set aside. allowed in part, the award of double damages is set aside, and the award of damages of five months’ pay in lieu of notice is maintained." Men that hire out their words and anger; that are more or less passionate according as they are paid for it, and allow their client a quantity of wrath proportionate to the fee which they receive from him. Joseph Addison writing in The Spectator (1711) on the subject of lawyers.